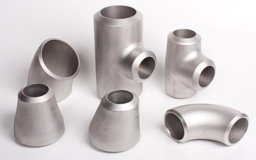 We Numax Steels are well recognised, reputed & leading organisation engaged in Manufacturing, Exporting & Importing of high quality Stainless Steel Fittings Manufacturer, Buttweld Pipe Fittings which are tested in severe condition to obtain a product which has high durability, tensile strength. We manufacture seamless buttweld fittings, welded buttweld fittings, SS Buttweld Pipe Fittings, Copper buttweld fittings, Nickel buttweld fittings, Carbon steel buttweld fittings, Duplex steel buttweld fittings, Alloy steel buttweld fittings and Brass Buttweld Fittings. 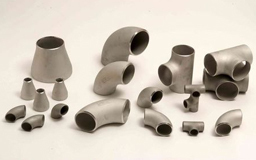 Types of Pipe Fittings Tee, Elbow, Reducing Tee, Coupling, Long & Short Stub Band, Reducer, Return Bends, Plug & Union, Cap, Collar, Cross, Insert etc. Alloy Steel Pipe Fittings ASTM A234 WP1/WP5/WP9/WP11/WP22/WP91 etc. 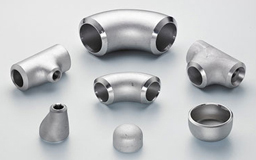 Nickel Alloys Pipe Fittings UNS N02200 (Nickel 200), UNS N02201 (Nickel 201), UNS 4400 (Monel 400), UNS 8020 (Alloy 20 / 20 CB 3), UNS 8825 Inconel (825), UNS 6600 (Inconel 600), UNS 6601 (Inconel 601), UNS 6625 (Inconel 625), UNS 10276 (Hastelloy C 276) Monel 400, Monel K500, Inconel 718, Incoloy 800, Incoloy 825, Hastelloy C22, Hastelloy B2, etc. Kazakhstan, Ouagadougou, Nairobi, Yemen, Abidjan, Brazil, Nigeria, Lagos, Harare, Africa, Tunisia, Accra, Zaria, Oman, Azerbaijan, Conakry, Jordan, Egypt, Rabat, Singapore, Tripoli, Dar es Salaam, Antananarivo, Kinshasa, Argentina, Luanda, Thailand (Bangkok), Cape Town, Iran, Port Harcourt, Kuwait, Kolwezi, New York, Malaysia, Abu Dhabi, Bamako, Brazzaville, Trinidad and Tobago, Casablanca, Venezuela, Kampala, Soweto, Australia, Angola, Cairo, Houston, Ethiopa, Dubai, Kaduna, Canada, South Africa, Cameroon, Democratic Republic of the Congo, Peru, Russia, Sudan, Douala, Johannesburg, Ibadan, Khartoum, Maputo, New Zealand, United States, Cyprus, Dakar, Sri Lanka, Mbuji-Mayi, Bahrain, Israel, Saudi Arabia, Ghana, Lebanon, Omdurman, UAE, Durban, Alexandria, Pretoria, Morocco, Fez, Kano, UK, Colombia, London, Maiduguri, Iraq, Algiers, Giza, Uganda, Addis Ababa, Benin, Mozambique, Vietnam, Germany, Lubumbashi, Bulawayo, Subra al-Haymah, Turkey, Port Elizabeth, Yaoundé, Qatar, Algeria, Italy, Indonesia, Freetown, Colombo, Hong Kong, Mexico, Mogadishu, Chine. Kolwezi, Subra al-Haymah, Benin, Suryapet, Harare, Maputo, Uganda, Colombo, Durban, Ahmedabad, Cape Town, Rabat, Cyprus, Zaria, Bangalore, Soweto, Morocco, Giza, Surat, Tripura, Antananarivo, Douala, Lagos, Baraut, Freetown, Thailand (Bangkok), Port Harcourt, Dakar, Mumbai, Jordan, Luanda, Oman, Khartoum, Omdurman, Tripoli, Bamako, Buxar, Bundi, Fez, Delhi, Brazzaville, Tadepalligudem, Russia, Mizoram, Ethiopa, Ouagadougou, Abidjan, Accra, Bulawayo, Algiers, Singapore, Manipur, Kampala, Pretoria, Algeria, Miryalaguda, Chennai, Udgir, Abu Dhabi, Yaoundé, Lebanon, Addis Ababa, Bhiwadi, Johannesburg, Kolkata, Puducherry, Democratic Republic of the Congo, Lubumbashi, Cameroon, Bansberia, Alexandria, Venezuela, Qatar, Conakry, Lucknow, Betul, Ghana, Ibadan, Pune, Muktsar, Kerala, Mbuji-Mayi, Yemen, Mogadishu, Jamalpur, Cairo, Hong Kong, Dar es Salaam, Nagapattinam, Nairobi, India, Hyderabad, Maharashtra, Benin, Andhra Pradesh, Sadar, Kano, Mozambique, Kinshasa, Ambala, Angola, Casablanca, Ballia, Jaipur, Maiduguri, New York, Kaduna, Karnataka, Port Elizabeth.